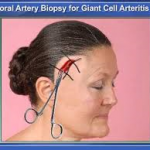 Temporal artery biopsy is the primary modality for establishing a diagnosis of giant cell (temporal) arteritis. Giant cell arteritis is a chronic vasculitis affecting medium and large diameter arteries, predominantly in older individuals [1,2]. The aortic arch vessels and branches, and particularly branches of the external carotid artery, are most prominently affected . The clinical manifestations result from inflammation of the affected arteries or from their gradual occlusion leading to signs of arterial ischemia [4,5]. The technical aspects of arterial biopsy by which to confirm a diagnosis of giant cell arteritis are reviewed here. The pathogenesis, clinical manifestations, diagnostic evaluation, and treatment of giant cell arteritis are reviewed elsewhere. Temporal artery biopsy is generally a straightforward procedure typically performed using local anesthetic with few complications. As such, there are no absolute contraindications. Click here for a complete list of hospital affiliations. Click here for a select list of conditions that our physicians treat on a regular basis. ®2014 Vascular Associates of Michigan, Inc.